SAVANNAH, Ga. - Dan McCarthy from Syracuse, NY and Palm Beach Gardens, FL, wins on the Web.com Tour! Dan carded rounds of 65-67-71-69 for a 16 under par total of 272 and a 1 shot win at the Savannah Golf Championship in Savannah, Georgia. With this win, Dan moves to 10th on the money list and in great shape to earn his PGA Tour card for the 2019/20 season. Dan entered the final round tied for the lead with two other players at -13. Dan birdied the 13th hole to get to -3 on the day and -16 for the event and 2 shots clear of 2nd place. Scottie Scheffler (even par on his round through 13) birdied 14, 15 and 16 to tie Dan at -16 with 2 holes to go. Scheffler boegied the par-3 17th hole and Dan made two pars on the last two holes to win by one shot. 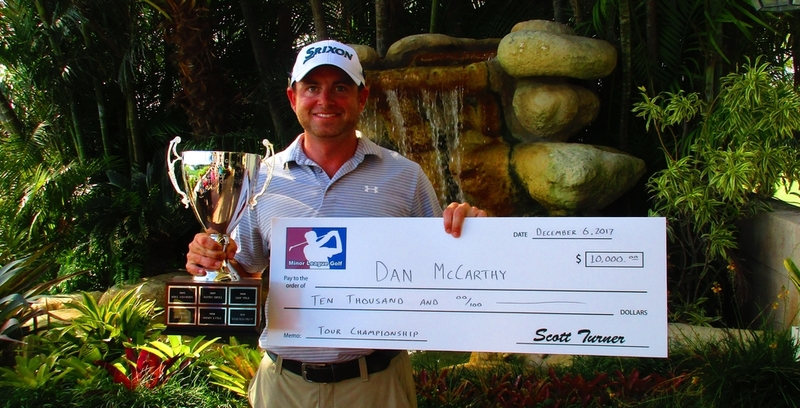 In a phone interview after Dan's 3rd Mackenzie PGA Tour victory in July 2016, Dan said "The Minor League Golf Tour has taught me a lot about myself and my game and how to close out tournaments coming down the last few holes." Dan has won 49 times on the MLGT amassing $160,960 in earnings since 2007. Forty one of Dan's forty nine MLGT victories were 1 day events. Dan also has 49 second place finishes on the MLGT. He said he has learned a lot about his game from being in contention so many times. In 2018, the Minor League Golf Tour ran 122 tournaments, 103 of which were one round tournaments. And that's not by accident. Jay Slazinski founded the MLGT in 2004 with a distinct vision that he thought would help the players. And that was to get them to feel what it's like to be in contention on the back nine as often as possible. If a player picks a schedule of 10-20 three and four day events throughout the year, he/she might get into contention on the back nine of the final round once or twice the entire year. If that same player played 6-10 one day tournaments each month throughout the year he/she is likely to be in contention much more often and learn what it's like and learn from every success and failure. Congratulations Dan on a your Web.com Tour win and good luck the rest of the season chasing your PGA Tour card!